Few events have affected United States history more proundly that the Tet Offensive of 1968. Tet caused a president to give up a reelection bid, let the U.S. to abandon a war, provoked a bitter, rancorous debate and contributed to the dissolute decade that followed. The Tet Offensive has been called America's greatest intelligence failure. That's only partly right. Although Americans and South Vietnamese did not know it at the time, the great communist offensive actually began in late 1967, when Loc Ninh and Dak To, both remote border centers, were attacked. In October, after assaulting a U.S. Special Forces base at Loc Ninh near the Cambodian border, the Viet Cong 8th Division was badly beaten by the U.S. 1st Infantry Division. When the communists finally broke off the battle and retreated, they left behind nearly 900 bodies. On November 6, in the middle of the country at Dak To, North Vietnam's 1st Division launched an attack -- but quickly found itself opposed by the 173rd Airborne and another brigade from the 4th Division. The fighting raged through much of November, taking the lives of 289 U.S. soldiers and more than 1,400 North Vietnamese attackers. American leaders noted that the communist units at Loc Ninh and Dak To didn't break contact when American firepower began to prevail. They had discarded their usual tactic -- quickly fading away when confronting superior force. 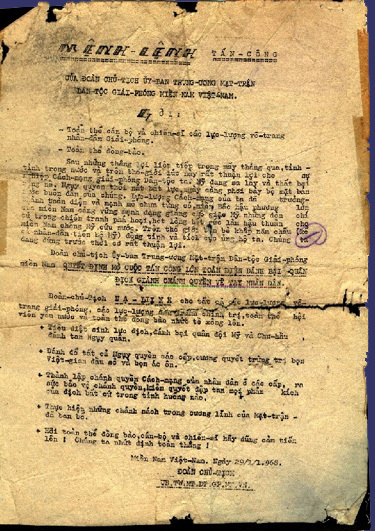 In late November, the American 101st Airborne Division captured a Vietcong document that described a forthcoming communist general offensive. The attack would be delivered throughout the country and would "liberate" Saigon, inducing an uprising of its inhabitants. No one put much stock in this plan, just one among thousands of such documents captured each week. Few could imagine the people of Saigon would take arms against a government they had just elected. 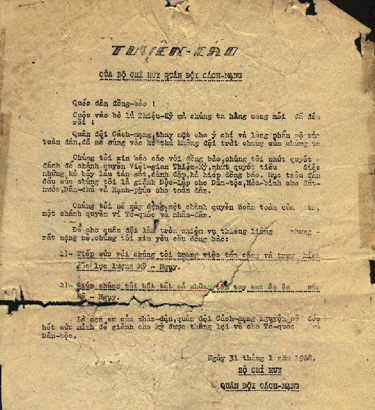 As was common at the time, copies of the document were distributed to the Saigon press corps. TO: -All Cadres and Soldiers of all the People's Liberation Armed Forces. After successive victorious achievements of the past few months, the conditions at home and in the outside world have become truly advantageous to the great undertaking of our People's Revolution and Liberation. The US is being bogged down, suffering a heavy failure. The impotent corrupt puppet government is showing more and more its face of a traitor selling down its country and its people. Our revolutionary forces have totally grown up and become powerful as never before. The North, as an ever solid and strong supporting rear to the South, is giving deadly hidings to the US aggressors in their devastating war, strenuously backing up the South in its anti-US patriotic war. Our friends all over five oceans of the world (including the progressive people of the United States) are wholeheartedly and positively supporting us. We are facing a favorable situation. - Destroying the enemy's vital forces, defeating the US and its satellite's forces, crashing down the puppet army. - Overthrowing all levels of the puppet government, firmly trying and punishing the traitor's chieftains and thugs. - Establishing the people's revolutionary government at every level, striving to protect the government, smashing to pieces all attempts of the enemy's counter-attack under all circumstances. - Implementing policies within the directives promulgated by the Front. - People, Fellow Countrymen, Cadres, and Soldiers! March forward bravely! Victory will definitely be ours! The awaited final days of the Thieu-Ky clique have arrived! On behalf of the people's will and indignation, the Revolutionary Army has opened fire on our death-feud enemy. We would like to inform our people that we firmly seek to overthrow the Thieu-Ky traitor's regime, to wipe out those who, for years, have murdered, tortured, and oppressed the people. Our struggle's objectives are to win Independence for the People, Peace for the Country, and Happiness for all of us. 1)- To support the Army in the attack and in the pursuit of the American and puppet troops. 2)- To help us nab all of the American- and puppet-hired wicked thugs. Being children and brothers of the people, The Revolutionary Army swears to put all our strength into the final task of securing victory for our Country and our People. In the next six weeks, there was a growing Allied awareness that something was up, but no consensus about what it was. A defector at Khe Sanh told U.S. Marines that the communists were planning to seize two northern provinces and the city of Hue. The attack was expected to begin at 12:30 a.m. on January 21. But an unusually large number of intelligence reports diverted Allied attention elsewhere in South Vietnam in the first few days of 1968. There were new, broad indications that communist main force units were moving, and some specific targets were mentioned. A scanty strategic picture began to emerge in late January, pieced together from various bits of tactical information about targets, unit plans or enemy movements, but there was no overall agreement about Hanoi's intentions. However, one piece of information proved to be right on the mark: The Khe Sanh attack unfolded just as the defector had predicted. On January 10, 1968, Lt. Gen. Frederick Weyland, the American II Field Force commander, began withdrawing forces from the outlying border areas. Weyland, a lanky Californian, was a Korean War veteran and former intelligence officer in Burma during World War II. He had come to know his enemy well during two years of duty in South Vietnam, having commanded the 25th Infantry Division there during 1966. He brought his displaced units nearer to Saigon. On January 29, General William Westmoreland, overall American commander in Vietnam, advised the South Vietnamese to cancel holiday leaves. But neither Weyland nor Westmoreland knew much about Hanoi's plan. American commanders were unknowingly reacting to a dramatic change in communist strategy for the war in South Vietnam. In May 1967, Ho Chi Minh convened his Political Bureau. There was to be a "spontaneous uprising in order to win a decisive victory in the shortest possible time." It would be a sudden, simultaneous attack by main force units, guerrillas and even the people themselves. The regulars were to lure the Allies to the borders, defeat them there, and then link up with local forces. Then the people of South Vietnam would rise and overthrow the government in Saigon. Briefings for commanders began in September. The uprising would begin during the Tet holidays, a period when a cease-fire was in effect. (The Vietnamese New Year celebration, Tet is a time of homecoming and family gatherings, combining elements of our Fourth of July, Thanksgiving and Christmas.) Although there were to be many attacks throughout South Vietnam during the great communist offensive of 1968, Saigon was Hanoi's main target. Twenty-two percent of the republic's people, the majority of the country's industry, and its political capital and financial center were all there. Moreover, big Allied logistical centers, military headquarters and two large airfields were within a 20-mile radius of downtown Saigon. On January 30, the eve of the attack, Weyland and his South Vietnamese counterpart, ARVN III Corps commander Maj. Gen. Le Nguyen Khang, met in a peaceful Saigon to discuss the possibility of a large scale communist offensive. Both officers knew that six towns to the north had just come under attack early that morning. They speculated that the offensive had already begun and hoped it would be restricted to the country's north and center, but they had already alerted their forces about possible attacks. They agreed that if the communists launched a general offensive, Khang would oversee Saigon's defense and Weyland would look to matters in the rest of III Corps. In late afternoon, Weyland left for his headquarters at Long Binh. Upon landing, he learned that the North Vietnamese 275th Regiment, an element of the communist 5th Division, was heading south towards his headquarters and would arrive before sunrise. Weyland considered his options. After his recent troop deployments, he had placed 27 American maneuver battalions with a 30-mile radius of the capital, twice the number previously available. Rather than try to reinforce every position that might be the target of an enemy attack, he provided for the possibility that, even now, he only knew the shape and whereabouts of the iceberg's tip. Deciding on flexibility, Weyland prohibited his commanders from committing their mechanized infantry or armored cavalry to battle without his express permission. If there was to be a major offensive around Saigon, an American counterattack would be led by armored units -- forces that could move rapidly at night, enjoyed excellent communications and abundant firepower and could simply roll over and crush any communist resistance. As the night closed in, tense Allied commanders had no strategic warning and had failed to grasp the full measure of Hanoi's intent. They did not know this communist offensive was aimed at winning the war. They did not know the North Vietnamese and Vietcong units were under orders to stand and fight and that the customary communist hit-and-run tactics had been discarded. And they did not know that Hanoi intended to seize Saigon. The lack of accurate strategic intelligence would prove costly. At 3 a.m., there was a massive explosion at the Long Binh Ammunition Depot, a rocket attack, and simultaneously, the North Vietnamese 275th Regiment assaulted the II Field Force Headquarters. However, the NVA regiment was stopped in its tracks by unlikely defenders -- mechanics, military policemen, clerks, drivers and communications personnel of the II Field Force and 12th Aviation Group Headquarters. The attack in Saigon had started a bit earlier with an ineffectual assault on the Presidential Palace at 1:30 a.m. However, more dramatically, 18 Vietcong sappers attacked the U.S. Embassy in Saigon. They killed several MPs and managed to enter embassy buildings. As a military action, the embassy attack was small potatoes. As a symbol, however, it signified a sea change back home. More militarily serious was that elements of the communist 9th Division had penetrated the perimeter of the large airbase at Tan San Nhut. The flight line was not in immediate jeopardy, but a South Vietnamese airborne unit protecting the base had its hands full. Weyland launched his armored fist forward at 4:30 a.m. Long before sunrise, throughout Weyland's III Corps area, diesel engines of American tanks and armored personnel carriers roared to life. The 3rd Squadron of the 4th Cavalry rumbled out of the perimeter at Cu Chi onto a darkened road. The unit's lead vehicle reached the highways, picked up speed and rushing headlong toward Tan San Nhut. East of the Saigon River, the 1st Squadron of the the 4th Cavalry moved out of its 1st Division motor parks and headed south toward Saigon. Farther east, the 3rd Squadron of the 5th Cavalry and the 2nd Battalion 47th Mechanized Infantry, 9th U.S. Infantry Division units, raced toward Binh Hoa, Long Binh and the North Vietnamese 5th Division. To the north, three powerful squadrons of the 11th Armored Cavalry Regiment thundered south. By 5:00 a.m. on January 31, more than 500 American armored vehicles were racing at breakneck speed toward South Vietnam's capital and its most vital area. The Vietcong and North Vietnamese had managed to get themselves surrounded, facing well-armored and well-supplied defenders as onrushing American armor units closed in on their rear. Oddly, the communists were less well prepared for the coming ordeal than were the Americans. Hanoi believed the people of South Vietnam would rise up and support Vietcong and North Vietnamese soldiers, but the First Secretary of the Communist Party in Saigon, who had succeeded in rallying only a handful of Saigon's citizens, had to introduce outsiders, rural local and main-force units. The overwhelming majority of the city's inhabitants who took part in the coming battle would fight against the communists, not for them. While some of the attackers got past Allied guard posts to reach their designated objectives, they had scant ability to stand up to the defenders and no way to prevail. For the most part, the North Vietnamese and Vietcong soldiers who arrived at their destinations would die there. Most of the communist attack elements would fail to reach their objectives either because they were intercepted by Allied units, their guides had failed to materialize or the caches of arms and supplies cited in the plan had long before been discovered and removed by the Allies. Moreover, some of the surprise that the plan depended upon had been forfeited. The units that attacked in six northern cities on January 30 had simply failed to receive the word that General Vo Nguyen Giap in Hanoi had ordered a day's delay. Despite numerous failures, the attackers would cause havoc in many places for a couple of days. In a few places, as in Hue, confused, house-to-house fighting lasted for weeks. When the great general offensive of 1968 ended, Hanoi had suffered a huge tactical defeat. Roughly 45,000 of the 84,000 attackers were killed. The goal of the massive offensive had been to seize the Allies' very heart, yet Saigon resisted, and in that regard, the offensive was most assuredly a total, abject failure. Strategically, Hanoi's first step in its plan for quick victory -- drawing the Allies to the borders for protracted battles -- had collapsed. While the Allies had taken the bait, they had defeated communist main force units at Loc Ninh and Dak To so quickly that American troops were able to return to the populated regions of South Vietnam in time to help defend those regions. Only at Khe Sanh did a prolonged encounter develop, but the contest there absorbed far more North Vietnamese than Allied troops, and results there were no better for Hanoi than in the two earlier border battles. When country-wide attack did come, communist commanders botched the timing, giving most of the Allies 24-hours notice. And the seizure of Saigon was far beyond Hanoi's capacity in 1968. Yet despite their mistakes, ironically, the communists had gained an enormous strategic victory, however inadvertent. They had won a psychological victory. American resolve was waning. An attack on this scale had been unexpected and it flatly contradicted General Westmoreland's November 1967 claim that the communists were incapable of large-scale operations in the populated regions of South Vietnam. Despite many failures and intelligence miscalculations that rivaled and in many cases even surpassed well-known Allied lapses during the Tet Offensive, North Vietnamese leaders could rightfully claim a major victory and the promise of a final triumph.